Swedish Lapland is a wonderful destination for a family holiday with a difference at any time of year. During the summer and autumn, nature takes centre stage and a host of exciting outdoor activities for all of the family are on offer. 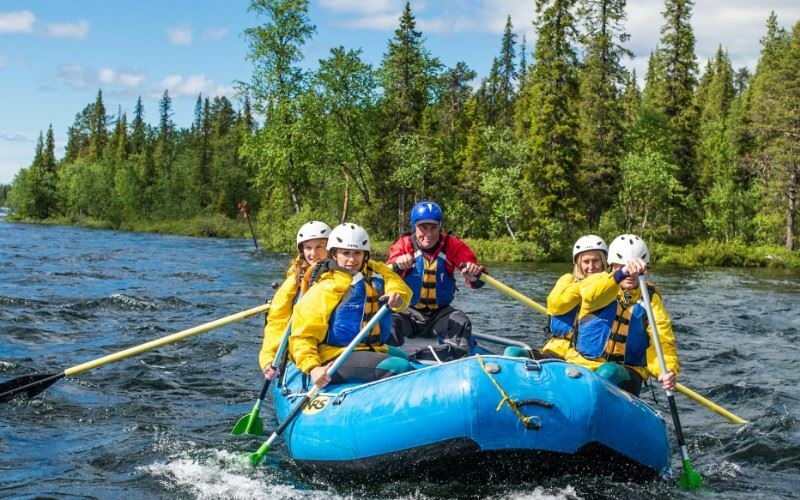 From hiking and cycling to rafting, zip-wire and treetop activities, ice sculpting, wilderness experiences and, as the Midnight Sun subsides, the chance of seeing the Northern Lights a trip to Swedish Lapland is one that the whole family will remember for a longtime. On arrival at Kiruna Airport you will be transferred to the ICEHOTEL in Jukkasjarvi on the shores of the River Torne. Tonight you will sleep in sub zero temperatures (between -5°C and -8°C) within the remarkable ICEHOTEL 365, a unique and fascinating accommodation concept. Your bed for the evening has been specially made from ice and snow and is insulated by a mattress and topped with reindeer skins. Your duvet for the night is a thermal sleeping bag. After a satisfying buffet breakfast at the ICEHOTEL restaurant you will join a small group of guests to take part in the ICEHOTEL’s most popular summer activity, a six hour rafting experience. For centuries the River Torne was the lifeline for Swedish Lapland transporting goods and people across the region, and more recently it has provided the building blocks for the ICEHOTEL (harvested from the frozen river each winter). On this tour, you will cross calm and white-water whilst being immersed in one of the most unspoiled landscapes in Europe and learning about its history and influence on life in the region. Lunch is taken at a wilderness camp on an island. This evening you will stay in warm accommodation at the ICEHOTEL. Morning at leisure. Time to explore the small hamlet of Jukkasjarvi or to hire canoes, stand up paddle boards (SUP), bicycles or fishing equipment from the property (payable locally). In the afternoon, head to the forest close to the ICEHOTEL for the Treetop Adventure. This 3 hour experience involves traversing six elevated obstacles, reaching heights of up to 18 metres above ground and connected by rope bridges and ziplines. This evening we have included a 3 course meal at the ICEHOTEL’s wilderness camp. From the end of August, as the night’s draw in, there is the chance to see the Northern Lights dancing overhead. Overnight in warm accommodation at the ICEHOTEL. After breakfast, you will be transferred to Kiruna Airport for your return flight to the UK.